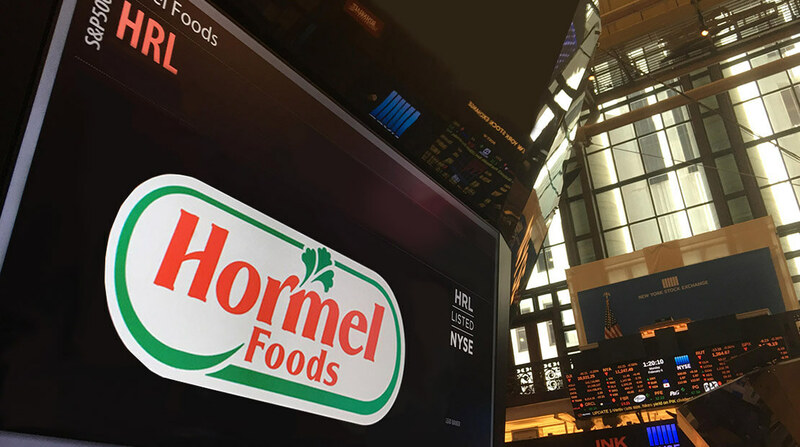 Hormel Foods Corporation (NYSE: HRL) today reported record performance for the fiscal year 2014 fourth quarter and full year. All comparisons are to the fourth quarter or full year of fiscal 2013. The company reported fiscal 2014 fourth quarter net earnings of $171.3 million, up 9 percent from net earnings of $157.3 million a year earlier. Diluted earnings per share for the quarter were $0.63, up 9 percent compared to $0.58 last year. Sales for the quarter were $2.5 billion, up 9 percent from the same period in fiscal 2013. For the year ended October 26, 2014, net earnings were a record $602.7 million, up 15 percent from net earnings of $526.2 million last year. Diluted net earnings per share were $2.23, up 14 percent from diluted net earnings per share of $1.95 last year. Sales for the year ended October 26, 2014, totaled a record $9.3 billion, up 6 percent from last year. “We hit the nine billion dollar mark in annual sales for the first time in our Company’s history, fueled by our branded, value-added product portfolios. We closed the year with record earnings per share of $2.23, a penny above the midpoint of our full year earnings guidance issued last November,” commented Ettinger. “Our Refrigerated Foods, Jennie-O Turkey Store, and International segments each delivered double-digit segment operating profit growth this year. High meat input costs and related pricing hampered growth of certain Grocery Products brands in the back half of the year. We have also substantially completed the integration of the MUSCLE MILK® brand in our Specialty Foods segment,” remarked Ettinger. “This morning we announced a 25 percent increase to the dividend, or $0.20 per share, making the annual dividend $1.00 per share in 2015. This marks the 49th consecutive year in which we have increased our dividend, consistent with our objective to deliver superior total returns to our shareholders,” stated Ettinger. Hormel profits up, boosted by Jennie-O turkey Hormel Foods Corp. on Thursday posted a strong first quarter, anchored by a star performance from its Jennie-O turkey division. Hormel Foods Corporation Declares Quarterly Dividend Hormel Foods announced today that its Board of Directors authorized a quarterly dividend on the common stock at twenty cents (20¢) a share.